Okie dokie...So, I know that I am not a make-up artist or even exceptionally "made-up" on a daily basis but I am someone who uses make-up daily. Actually, I am so NOT a make-up artist that I even apply my face while driving. I'm talking...freeway driving while applying everything. Foundation. Eyeliner. Bronzer. Mascara. Curling lashes. EVERYTHING. Since my make-up application environment is a bit extreme, I need products that help me to apply quickly and easily with little mistakes. I have found the worlds best eyeliner, and decided to share it with the world! 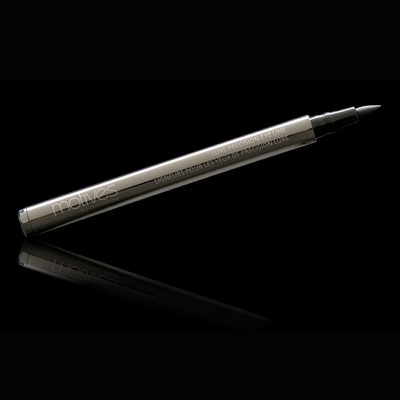 Its a liquid liner that applies like a pencil. It goes on so well AND stays on all day! Side Note: I have recently made a commitment to apply all makeup at home in the safety of my bathroom, since I am having a baby and need to focus on safer driving practices!! !